Shes blond an beautiful. Hes big and hairy and his knuckles scrape the ground when he walks. Theyre Angel ODay and Sam Simeon - a.k.a. 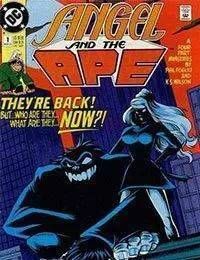 ANGEL AND THE APE - and theyre back to star in a miniseries that pits them against one of the greatest threats ever faced by man and ape alike! Angel is a tough private investigator, Sam is a cartoonist (hey, a talking gorillas got to work, right? )...and Sams got a problem. Hes momentarily been turning human. But whos going to believe his story...except his friend and partner Angel, of course? Mixed up in this mess is Angels meta-human sister, Athena (also known as Dumb Bunny of the Inferior Five) a group of gorilla goons and Sams dangerous grandfather...the noted Flash adversary Gorilla Grodd! And, as gorillas are popping up all over the place to set mankind up for a big fall, Angel, Sam, Athena and the rest of the Inferior Five set out to get to the bottom of this hairy situation. Meanwhile, Grodd tries to bring his reluctant grandson back into the ape fold to help wrest control of the Earth from the humans...because without Sam, his whole plan will go straight down the drain.